(a) Questions related to PART-A (General Engineering–Civil & Structural), PART-B (General Engineering–Electrical) and PART-C (General Engineering– Mechanical) depending upon candidate’s choice filled at the time of registration will appear first. (ii) General Awareness will appear after that. Candidates must ensure at the start of the Examination that their choice of stream (Civil & Structural / Mechanical / Electrical) filled at the time of registration is appearing correctly on their Computer screen. Any discrepancy, if observed, must be brought to the notice of the Examination conducting officials available at the venue immediately. 1. Candidates are strictly advised to desist from bringing bags, mobile phones and prohibited items into the examination venue. 2. 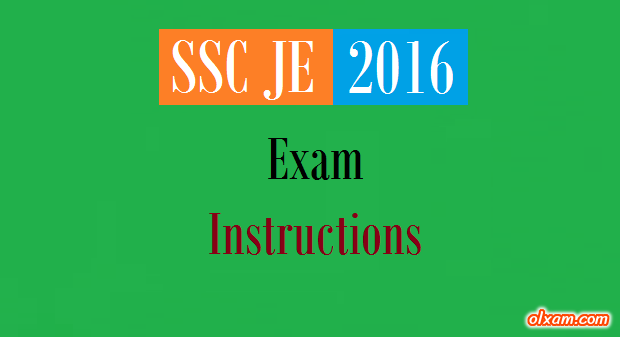 Candidates are cautioned that they should appear only once for the Junior Engineer Examination 2016 (Paper-I). Any candidate, who appears more than once for the examination, would not only be disqualified from the said examination but would also be debarred for three years from all future examinations of the Commission. 3. Candidates are strictly cautioned to refrain from creating any obstruction during the conduct of the Junior Engineer Examination 2016 (Paper-I). If any candidate is found obstructing the conduct of the examination or creating disturbances at the examination venue, his/her candidature shall be summarily cancelled. Such candidate shall also be liable to be debarred from future examinations of the Commission and legal/criminal proceedings could be initiated against him/her. 4. It may also be noted that no re-examination would be conducted if it is found that the examination was disrupted on account of instigation by the candidates.